Interviewer: You and I are talking today on the eve of an important historic date: September 1, the 70th anniversary of the beginning of World War Two. Now, in Europe, there is an unbelievably wide range of assessments as to why this horrible tragedy was started. What are your thoughts on this matter? DMITRY MEDVEDEV: These events were the greatest tragedy of the 20th century. It was a tragedy that took the lives of about 70 million people, according to various estimates, as this figure has never been fully determined. Thus, there can be no other view of those events. Of course, there is also the issue of how these events are interpreted in different nations. And here, unfortunately, there are some clear setbacks. Just 20 or 30 years ago, even within the so-called political and ideological blocs that stood in opposition to each other – by which I mean the West and the East, the Warsaw Treaty and NATO – everyone agreed that Nazism had been rightfully condemned by history and that Nazi criminals who were judged in the Nuremberg trials were serving out a just punishment. This was the case, even despite our differences in ideological approaches, which is why I specifically brought it up. Now, we share relatively common values, and we no longer argue about what we see as the most important values in our societies, the values that should serve as the foundation for our nations, and how we should build our economies. Nevertheless, we are seeing some astounding trends. Governments in the Baltic States and even Ukraine are now essentially pronouncing former Nazi accomplices to be their national heroes who fought for the liberation of their nations. Of course, everyone knows what really happened, but everyone looks down in shame, so as to avoid souring relations. I have one final thought regarding this matter. We really must treat our history with a lot of care, especially concerning those issues that were assessed in the same way throughout the world. We cannot destroy the institutions that were formed as a result of those tragic events. We cannot disregard all those things in order to favour some states that are currently developing and are in the process of forming their national identity. We must think about the future. And this, I think, is one of the most important lessons that can be learned from the 70th anniversary of the beginning of the 20th century’s greatest catastrophe – the beginning of World War Two. These comments are about 24 minutes into this video of the interview. Medvedev's views are already causing a stir..
"The Great Pipeline Opera - Inside the European pipeline fantasy that became a real-life gas war with Russia." The report can be watched via this link here and available for just a few of days or so.. Beautifully filmed and edited too..
Below I have loosely translate several portions from a blog by the big-selling Russian language 'Segodnya's' chief editor, Igor Guzhva. "Why Medvedev is not right - The President of Russia is helping the national-fascists by his statements. I am ready to put my name to practically all of the points raised in Medvedev's letter to Yushchenko. But, I am a citizen of the Ukraine - I have the right such to say these things to the President of my country. I have the right to criticize his policy of integration into NATO, since in my opinion, it does not correspond to the national interests of Ukraine. I have the right to criticize the policy of forced Ukrainization. But here Mr. Medvedev, as the President of a foreign state, does not have a right to call Yushchenko to account. Medvedev's efforts will ensure that all Ukrainians who speak out against NATO or against Ukrainization, will automatically be treated by the authorities as fifth columnists of Russia. They will say: "Look, those bastards are singing to the tune of the Russian aggressor..."
What is worse, Medvedev is pushing many Ukrainians who are wavering into the camp of the nationalists. According to data from opinion polls, 70-75% of the population of Ukraine relate very favourably to Russia, they want them to be friends, to develop links etc. This actually is a pro-Russian majority. But only about 25-30% of Ukrainians should be considered as political Russians, i.e. those, who are in favor of the re-creation a political union with Russia in one form or another. The remainder, i.e. 40-50% of the pro-Russian majority do not want spoil relations with Russia in any way, they want open boundaries, they are not ready to go in NATO, particularly as the overwhelming majority do not love the Americans, and they do not need any forced Ukrainization. But they have become accustomed to independence. For many of them it has become valuable, and they are fearful of changes that could lead to its possible loss. They are fearful of the reaction of the West and of the threat of isolation of the country. There is a greater task - of moulding a new Ukrainian patriotism, based not on hatred for Russia, but on the respect for its sovereignty and uniqueness, and on its protection, including, also, from the West. 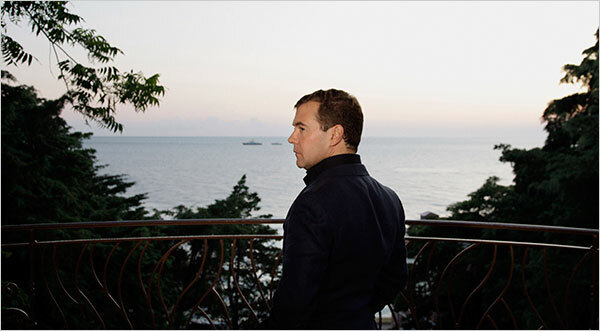 But the statement of Medvedev, does it help or hinder the accomplishment of these objectives? Certainly it hinders. It throws into the camp of the enemies of Russia and nationalists the Central Ukrainian ordinary Joe who does not like the Americans for their bombing of Yugoslavia, who supports the Russian team in the European championship, who despises Yushchenko, and curses "Yulka" the fibber [brekhukhu], fears the Banderites, respects Putin and celebrates on May 9th his main commemorative day. But the ordinary Joe does not want for someone from the outside, neither from Russia nor the West, to dictate what is right for Ukraine and what is not. There are many such Joes, not only in central Ukraine, but also in the southeast, particularly amongst Russian language speakers. The question of entry into NATO and curtailment of forced Ukrainization must be transferred away from the plane of Russian-Ukrainian intergovermental relations (which Yushchenko wants, with the aid of Dmitriy Medvedev) into the plane of purely intra-Ukrainian policy..."
p.s. Igor Guzhva's views do not necessarily coincide with LEvko's, particularly on the language issue, but his blog gives an insight into the mindset of many Ukrainians. Ukrainian National Flag Day celebrations will take place in front of the Donetsk Oblast State Administration building, with the participation of the chairman of Donetsk O.S.A. V.I. Logvinenko, chairman of the Donetsk Oblast Council A.M.Bliznyuk, and Donetsk city head A.A.Lukyanchenko, on August 23 starting at 9.00 a.m. Together with the representatives from oblast community youth organizations and those of Donetsk, the oblast and city leaders will assemble around the flag - the symbol of the unity and consolidation [sobornost] of Ukraine. The flag measures 30X45 m.
The article goes on to expain that the initiative to manufacture this flag came from Donetsk in 2007, and it has since been unfurled at at various historical remembrances, at historical sites etc. The flag was sewn by a Donetsk miner's widow and was later displayed around the country by young people from that city. p.s. Also check out this from today's FT, which may or may not be connected to the above..
Russia and Germany stitching up Ukraine again? "World Agenda: Merkel and Medvedev share Ukraine's Munich moment"
Will Angela now explain her lack of response? Maybe her silence was a thank-you for last month's declaration by Russia's defence ministry that it was Poland that had provoked the second world war by refusing to yield to Germany's "modest" ultimatum demands in 1939. All Poland's fault then..The Molotov-Ribbentrop pact - very reasonably under the circumstances..
Polonium -210 trails in Hamburg...deaths of Russian journalists..hardly worth mentioning..
"Following the answer of the President of Ukraine Viktor Yushchenko to the address of the President of the Russian Federation Dmytro Medvedev the Prime Minister of Ukraine Yulia Tymoshenko made a statement concerning Ukrainian-Russian relations. “Despite the fact that foreign policy appears a constitution prerogative of the President I cannot keep silent about recent events in Ukrainian-Russian relations. In view of their importance I cannot but [be concerned] bother [about] with a high [the high temperature of polemics] degree of the public dispute in this topic. The feeling of responsibility for the country is a good way for every politician to keep emotions [in check] in any situations, even hard ones. As Prime Minister I have always done and still do all my best to deepen mutually beneficial cooperation between Ukraine and Russia, first of all, in economic sphere which is a responsibility of the Government. I will act the same way taking any other position entrusted to me by Ukrainian people. Relations with Russia have always been built and will be built by me on [as] equals on the bas[e] of national interests, mutual benefit, respect to the sovereignty and territorial integrity. At [Along with] this, Ukraine will determine its foreign and internal policy independently, without any external interference, including in the humanitarian area. We will be learning [studying] our own past, will be coping with our present matters, [and] will independently build our own future. Realization by Ukraine of our [its] sovereign rights, forming of the current policy of the nation is not, [viewed] and can never be viewed as a policy directed against anyone. We are always ready to hear and entertain thoughts of our partners on East and West alike, taking into account their interests, but meddling into our internal matters is [impermissable] unaffordable. I would like that Ukrainian and Russian diplomats of all levels could solve the problems, which are inevitable in relations between any other countries, not by way of confrontation and public dispute but at the negotiation table. I also consider [it to be] as inadmissible any pause in the development of cooperation between Ukraine and Russia. Our Government will be acting [to overcome] reasoning from this. p.s. maybe the translators in the Cabinet of Ministers are all away on holiday..
What is it with these Russian height-challenged testosterone-charged men? Turning off gas supplies in the midst of winter was not directed at Ukraine's population either, I suppose.. Although I have criticised many of Patriarch Kirill's pronouncements during his visit to Ukraine he did make some sensible observations on the dangers of what some writers have called 'turbo-consumerism'. Below are links to two recent newspaper articles which explain why the insatiable pursuit of "more" will never make people happy. on "Enough is enough: learn to want less" and "Addicted to Shopping"
Will Ukraine's ruling elites take any notice? Not a chance..
Patriarch Kirill's visit to Ukraine a success? Hmm.. According to pravda.ru, during Patriarch Kirill's visit to Ukraine: "the idea of the "Holy Rus," or "the great Eastern-Slavic civilization" as a spiritual and historical, rather than a political, entity capable of saying something important to today's secularized world without forfeiting the link between the earthly and the divine, served as the leitmotif throughout all of the Patriarch's speeches." "By no means do I oppose the Western world — I know the West well and lived in the West, - but why, in dialogue with the Western world, do we accept the role of 'the led' so easily? What values do they offer us? What unique thing does this rich civilisation tell us today? Why do we give up our primacy so easily? We are ready to enter a united Europe, into any other Europe. [But do] We enter there to receive ideas? To graft a certain correct form of life[style]? [Do] We enter there for the sake of our stomach and our pockets? Sure, this too is quite good. But let's bring our values [too]; but I do not believe that they will be ready to accept [these] values there. However, to enter as 'the led', losing spiritual primacy, renouncing our tragical, but unique, incomparable experiences, raises major doubts with me. I think that our unity - the unity of the spiritual space of Sacred Rus, historical Rus, is a civilizing project of huge force which is not destined to be led. It is destined to generate ideas, and this is now taking place.. We have a potential for the development of a genuine dialogue between the East and the West, but not the dialogue between a horseman with a horse..."
Three years ago Adrian White, an analytic social psychologist at the University of Leicester School of Psychology, in Great Britain analysed data published by UNESCO, the CIA, the New Economics Foundation, the WHO, the Veenhoven Database, the Latinbarometer, the Afrobarometer, and the UNHDR, to create a global projection of subjective well-being: the first world map of happiness. Studies elsewhere have produced results similar to those obtained by Adrian White. Secular meritocratic European countries, with high standards of living, long life expectancy, excellent education, health and welfare services score very well in these comparative studies, whilst Russia, Ukraine and other former Soviet Socialist Republics fare particularly badly. For example, in Adrian White's study Russia lies at a miserable 167th position out of 178 countries. In Ukraine, the young, and particularly the ambitious and dynamic are most conscious of these great differences. I do not believe Patriarch Kirill's messages about Sacred Rus or 'the great Eastern-Slavic civilization' having anything important to say to the secularized world, or to Western European neighbours, will make much impression on these people. 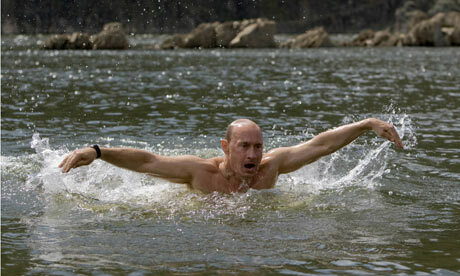 The man will not be taken seriously, even if he himself thinks his trip was a success..
Something to think about from 'The Guardian': "Stormy outlook over the Black Sea"
*Putin doing the butterfly..while on holiday -"It may have a fug of raw, sweating masculinity about it, but it's also the most irritating of all strokes. It's splashy and unsociable, an uncompromising stroke that pays no heed to the elderly gentleman choking on chlorinated backwash in the neighbouring municipal [swimming pool] lane.."
Watch a one and a half hour video of last week's presentations at the Center for American Progress by former Assistant Secretary of State David Kramer, former U.S. Ambassador to Ukraine Steven Pifer, and the brilliant James Sherr, head of the Russia and Eurasia program at the Royal Institute of International Affairs, discussing Ukraine’s upcoming elections, the Ukrainian economy, U.S.-Ukraine relations under the Obama administration, and the impact of the "reset" of U.S.-Russia relations on Ukraine. Volodymyr Lytvyn was supposed to have attended too, but for some pukach reason he failed to show up. Update: Also check out this insightful piece - '10 years of Putin', from stratfor.com, which explains why Russia is as it is..
Holy smoke! Beyonce in Donbass! I can heartily recommend this excellent analysis by Ivan Krastev, entitled "The guns of August: non-event with consequences", on the political fallout, one year on after the Russia-Georgia war of August 2008. Would the Patriarch approve? Check out this video..
Did ZZ Top attend too? Kirill fighting the pull of the European magnet.. The head of the Russian Orthodox Church, Patriarch Kirill's 10-day visit to Ukraine has caused some disquiet, as illustrated by this recent blog on the 'Segodnya' site entitled: "The patriarch as a civilizing tool - a hyperboloid of engineer Putin" . The author of the article disparages Patriarch Kirill's criticism of a recent OSCE declaration which equates the crimes of Nazism and Soviet Communism. [The Patriarch follows the standard Kremlin line that Stalin's crimes were merely 'excesses']. The author considers the Patriarch was given a far too open and unchallenged platform on Inter TV to air his views, and describes, what was, in his opinion, the main purpose of Patriarch Kirill's visit to Ukraine. "The main message of the head of Moscow Orthodoxy was that "Sacred Russia" should not be led [or be guided] by the West". These words mean, that according to the patriarch, European (or so-called western) values do not suit the so-called Slavic mentality. The Patriarch, in the name of the church, declares that there is a certain Slavic mentality for which a special approach is necessary; and the foundation of this mentality is a certain "Sacred Russia", which, in the given context, is opposed to Western values and Ukrainian attempts to rewrite history." The author challenges these ideas, and continues: "The aim of the "Sacred Russia" project consists only of maintaining the status quo...maintaining a spiritual influence over Ukraine which is boldly rushing into 'the abyss of Western values', (it is well known, the majority of Ukrainians support idea of entry into the European Union). The "Sanctity of Russia" is an abstract concept that not all orthodox believers can explain. It counterposes the Eastern slavic world with other orthodox peoples, e.g. Romanians and Georgians. This idea is dangerous as it declares the supremacy of one set of values over others, and carries the risk of conflict which could result in the construction of the new Iron Curtain. The main question is where its border will be - on the western, or on the eastern border of Ukraine. In essence, the statement that Slavs do not accept European values is similar to the statement that Ukrainian officials cannot live without taking bribes. It is grandiose lie. Why should European values suit orthodox Romanians, but not orthodox Ukrainians? Certainly, the church in its current state cannot support the points set out above for the reason that after the implementation of European legislation in Ukraine or Russia, the church would lose all levers of influence on the state... Freedom of worship does not suit the orthodox church, and in Russia legislation very rigidly regulates registration of new religious communities - lessons in Orthodoxy have already been introduced in schools. It seems that Moscow wishes to offer Ukraine the same system of preservation of so-called "traditional values" via the mouth of the Patriarch with the help of some kind of "spiritual uplift", to enable the elite, which we so hate with all our heart, to remain in power. For the Kremlin the main thing is that the border of European values remains on the western border of Ukraine, and Ukraine remains in sphere of influence of the Kremlin. The patriarch has arrived to rescue the Ukrainian elite, to offer it a way to eternally remain in power and 'in the money'. The irony of the situation is that huge numbers of Ukrainians have travelled in Europe, studied in Europe, lived in Europe and know than in the EU the organisation of life differs from the organisation of life at home, so for the normally-developed person all these fairy tales on the Slavic mentality are simply nonsense. European values are craved in Ukraine and Ukraine will come to them, as will Russia. The question is only at what rates. To be an opponent of Western values in the modern world is the same as trying to stop a million hedgehogs with a naked backside. It will happen, even if all of the advocates of "Sacred Russia" try to do this..."
Incidentally, the chief editor of 'Segodnya', in his blog defends Patriarch Kirill's anti-European stance (and also reveals a surprising ignorance of attitudes amongst citizens of the EU's newest Eastern European member countries). But I'd bet he drives a Beemer or a Merc or one of those other disgusting European motors ..